I’m delighted to be joined by Jerry Coyne on The #GSPodcast. We’ll be delving into the debate regarding whether it’s possible to reconcile faith claims with our scientific understanding, which is the topic of Jerry’s new book ‘Faith vs. 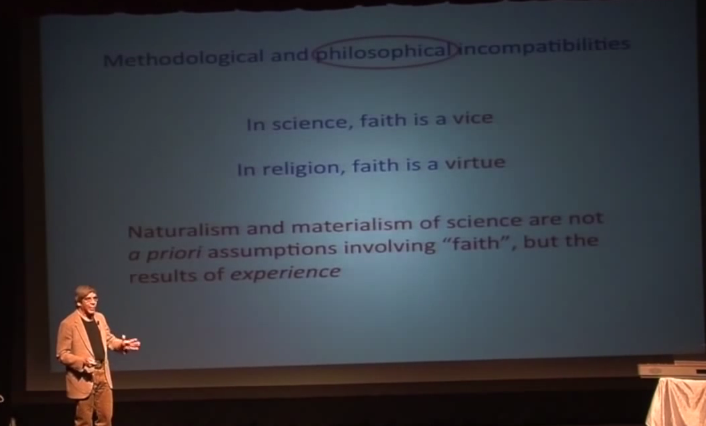 Fact: Why Science and Religion Are Incompatible’. We also take the time to discuss ‘Trigger Warnings’, Creationism, Evolution, troubling polling data and how exactly one can become an atheist by listening to The Beatles. Jerry’s comments on “trigger warnings” are just fine, as far as they go. But we don’t often hear what I think is most important to consider when talking about them: the whole notion of these things as it applies to the current campus craze, and to “social justice warriors” everywhere, is less about being *actually* hurt or “triggered” by something, and more about what I would call grandstanding, or calling attention to something which allegedly transgresses the boundaries of what is supposedly acceptable. Even a casual look into the world of these mostly young would-be feminists and social justice activists reveals a pattern of almost competing to come up with new and more precious ways of being offended. No; he was just an ordinary, if conventional, person, the likes of which you’ve encountered all your life. You just needed a dramatic way of highlighting your unimpeachable hipness by comparison to him. Put simply, we’re in the latest era of the drama queen. This is what we can expect kids (in particular) to do! Excellent podcast. Jerry Coyne, as always, hits the proverbial nail on the head. I was shocked to find out that GS is actually Lady Gaga. It makes sense, though, as I’ve never seen both of them on stage together. 🙂 Are we witnessing the birth of a new conspiracy theory? Coyne/Harris and atheist dogma is guilty of magical thinking along with the religious beliefs they demonize – and they are being dishonest as well. Coyne, along with other atheists, insists on demonizing religious “beliefs.” Beliefs are just statements people make using everyday language. Religious beliefs are just everyday statements of magical things happening and existing. By definition they are lies since nothing magical exists. Coyne presumes that magical belief/statements causes behavior. This is probably not true but certainly unproven and just a pop culture presumption and intuition. In fact, the vast experimental evidence of no free will, which Coyne/Harris/etc accept, likely proves that beliefs/statements are post hoc and correlated but not causal with behavior. So atheist dogma fails the basic test of both empathy and scientific evidence for it’s central claim that religious beliefs/statements cause harmful behavior. That too is likely a lie and more magical thinking. Why anyone with a public role would waste time debunking any magical belief is puzzling. Why hasn’t Coyne written about voodoo, astrology or belief in fairies? We can assume Coyne’s livelihood has always been threatened by “religious” spouters, so he defends his bank account. Fair enough. We still wait for a public intellectual to look at the real brain-based causes of behavior and ignore magical beliefs/statements as the trivial, epiphenomena they are – in terms of causing behavior. That hard work will not come from a prof of evolution likely. Hi. Thanks for your comments. I’d like to address a few points. I’m not sure what you mean here. Yes, data seems to suggest we are not consciously aware of our decision making process – yet there’s nothing to say outside stimulus cannot be a causal factor on our brain states/decisions. You’re conflating two issues. Not being consciously aware of making a decision, does not mean there can be no external causal factors. Which is to claim that no believer really believes the things they say they do, or the contents of their scripture. Seems a bold claim given believers demonstrate their sincerity every single day. I assume people praying 5 prayers times a day towards Mecca do so for the giggles? Why anyone with a public role would waste time debunking any magical belief is puzzling. Why hasn’t Coyne written about voodoo, astrology or belief in fairies? Likely because Academics and Scientists are often interested in the most consequential of ideas. Unlike religious faith, voodoo, astrology, fairy belief don’t typically encroach on society, politics, healthcare, equality and science, do they now? You are engaging in the same kind of hand-waving as atheist dogma is selling. There is no experimental, peer-reviewed evidence that magical beliefs cause behavior. Provide the citations, if you got ’em. If you don’t know the no free will research, why are you spouting off on here? There’s no data to suggest beliefs influence behaviour, is that what you’re saying? It seems to me it doesn’t matter whether they are ‘magical’ or otherwise. The belief is considered true by the believer. I didn’t say I didn’t know the ‘no free will research’, I said I didn’t know what *you* meant, given you confused internal decision making with external causal influences. I note you’ve chosen not to address that point. I did a podcast on free will last month that covers this specific point – perhaps have a listen and learn something. Ah, so you are going to censor the comment. Predictable. The truth is always uncomfortable for ideologues. Censor what? Your comments are published, there to see. They go in a moderator queue (as with most blogs/websites) and I don’t live on the internet, nor am I The Flash. Incidentally, you don’t appear to understand censorship. You have a right to say what you want. You don’t have a right to be heard however. This includes not having the right to have your comments published on someone else’s web space. Censorship would be if I came to *your* blog and removed your comments. I have published your comments however, making your hot-headed, paranoid accusations seem a little silly. Look, the default of the human brain, and likely other animals since humans are not exceptional, is denial, avoidance and disassociation. Coyne, Harris and the atheist community show all of these when they make statements about religion and harmful behavior. The athetist dogma is that magical-religios beliefs, really just statements, cause harmful behavior. This is a predictive, scientific claim that needs peer-reviewed, medical, experimental evidence to be true. On the flip side, how can the Coyne/Harris/atheist belief-dogma that religious beliefs cause harmful behavior be disproven? Duh, this is not a real complicated matter. How are religious beliefs ‘just statements’? Especially when religious people *behave* in *accordance to them*. Bizarre point. The very fact that a particular religion can be identified solely on the *behaviour* of its adherents demonstrates you’re wrong. If someone is talking about The Prophet Muhammad and says “Peace be upon him” right after – what are the odds that’s a completely random bit of behaviour? Just about everything he said. Righto, Coyne/Harris and atheist dogma is nonsense with no scientific basis in fact. Can you outline this ‘atheist dogma’ you’ve decided exists? By blaming “religion”/magical statements for harmful behaviors Coyne/Harris/atheists block real problem-analysis and problem solving about harmful behaviors, and denies all the good brain science about how behavior is caused and mental illness. Coyne, for example, has banned brain science from his blog – except for the no free will research. It is also dehumanizing to the people who do the harmful behaviors. The old idea that just getting all Muslims to “think right” is really dum.